In addition to its beautiful scenery and booming economy, Tonghua also has a heroic history. The Cemetery Park of Revolutionary Martyr Yang Jingyu, covering 20,000 square meters on a hill on the eastern side of the Hunjiang River, is built in 1954 to commemorate General Yang Jingyu, a great anti-Japan-aggression hero. The park consists mainly of five classic, richly ornamented buildings with glazed tiles. Facing the entrance to the cemetery is the main building, which is divided into a mourning hall and an exhibition hall to show achievements of General Yang Jinyu. The main building is flanked by four exhibition rooms. Numerous evergreen pines and cypresses grow splendidly in the park. 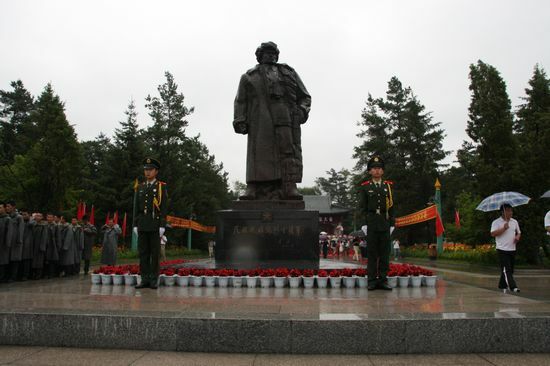 A 3.8-meter-high bronze statue of General Yang Jinyu built in November 1985 weighing 4 tons stands solemnly in the park. In commemoration of the 100th anniversary of the birth of General Yang Jinyu, the park rearranged its exhibitions and built a 3800-square-meter memorial hall for the Northeast Anti-Japanese United Army. The numerous pictures, documents and cultural relics in the memorial hall fully reflect the struggles of the allied army against the Japanese aggressors. 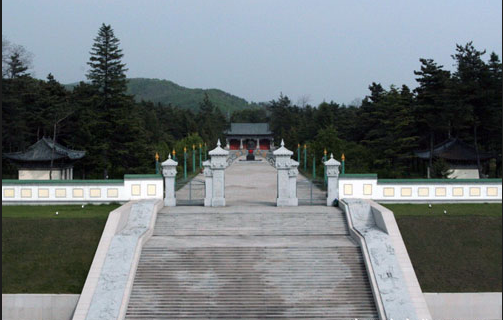 The Cemetery Park of General Yang Jingyu has also been designated as a demonstrative zone for educating patriotism and one of China’s top 100 red tourism spots. About 3 kilometers away from the railway station and coach station (old one) of Tonghua and about 2.5 kilometers away from the new coach station. Touritst can start from the railway station (passenger transport station), then drive along Jianshe Road to the new coach station square and then along Jingyu Road until the cemetery park is in sight (No. 888 in Jingyu Road). Please pay attention to road signs. After getting off a train or coach at Tonghua Coach Station (old one), tourists should take No.1, 3, 6, 19 or 33 bus to the new coach station square and walk along Jingyu Road for about 500 meters. Tourists can also take No.2 or 23 bus at the new coach station square to the cemetery park station. The total length is about 2.5 kilometers from the coach station to the scenic area.